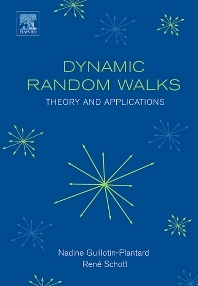 The aim of this book is to report on the progress realized in probability theory in the field of dynamic random walks and to present applications in computer science, mathematical physics and finance. Each chapter contains didactical material as well as more advanced technical sections. Few appendices will help refreshing memories (if necessary!). This book is intended for mathematicians, computer scientists and all researchers interested by recent developments in probability theory and their applications. The book contains introductory material for graduate students who are new to the field, as well as more advanced material for specialists. Nadine GUILLOTIN-PLANTARD has been Maître de Conférences (i.e. Associate Professor) at the University Claude Bernard, Lyon, France since 1998. Here research interests include the study of time and/or space dependent random walks and their applications in computer science, biology and finance. She serves as referee for many journals in mathematics and authored or co-authored more than 20 published journal papers. University Claude Bernard-Lyon 1, Institut C. Jordan, Villeurbanne, France. René SCHOTT has been a full Professor at the University Henri Poincaré, Nancy, France, since 1987. His research interests include the study of stochastic processes and operator calculus on algebraic structures and their applications in computer science (probabilistic analysis of algorithms, random generators, randomized algorithms, optimization problems). He serves as referee for many journals and international conferences, both in mathematics and in computer science. He is the co-author of eight books and has also authored or co-authored more than 100 published journal and conference proceedings papers. Dr. SCHOTT has received numerous collaborative research grants from such agencies as the National Center for Scientific Research (CNRS), INRIA, National Science Foundation and PROCOPE. He was granted the Silver Medal by the CNRS with the team EURECA-CRIN) in 1987 for his achievements in theoretical computer science. He is a member of the editorial board of International Journal of Mathematics and Computer Science, Scientific Committee of IDAQP, American Mathematical Society, French Mathematical Society and European Association for Theoretical Computer Science. University Henri Poincare-Nancy 1, Institut E. Cartan and LORIA, Vandouevre-les-Nancy 1, France.